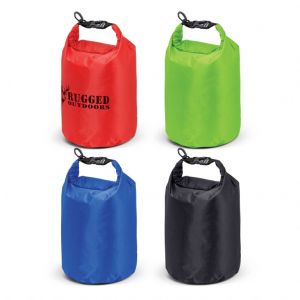 Large ten litre dry bag with heat sealed water proof seams. It is manufactured from robust 210T laminated nylon grid cloth. Simply roll down the top closure several times and close it with the snap lock for a waterproof seal. It is ideal for storing valuables and electronic devices in the outdoors and around water. H 410mm x W310mm x Gusset 82mm. Digital Transfer: 170mm x 150mm.